We bring this article from the archives of Sanathana Sarathi, the Ashram’s hallowed magazine, as it celebrates its 50th anniversary this year. Sivarathri attracts mammoth gatherings to Prasanthi Nilayam, to witness the emergence of the Linga from the Divine Body of Baba, and so, to serve the devotees, contingents of Seva Dal members trained for the purpose by the Sathya Sai Seva Samithis of different linguistic regions from Hyderabad, Eluru, Guntur, Vijayawada, Bombay, Mangalore, Bangalore, Kerala, Delhi also arrived in time, to be blessed and directed by Bhagavan, who inspired them with His Divine Discourse on the evening of 4th March (1970). Dr. S. Bhagavantam spoke to the men and women volunteers on the attitude of surrender that the member of the Seva Dal has to cultivate, for, Seva at the Prasanthi Nilayam as well as everywhere is a Sadhana. Baba exhorted the volunteers to feel that their Seva is a form of worship, (dedicated to the God resident in every one. Seva destroys the ego and confers Ananda, on the giver as well as the receiver, He said. It is a transformation of the mind, the compassion onegets automatically, at the sight of distress, pain or grief). "Wherever you are, whatever the time, when you meet situations that require help, render it, to the best of your capacity,” advised Baba. "You yearn to do some Seva to Me, isn’t it? Well! I have a thousand hands and feet, a thousand eyes and hands. Sahasra-seershaa purushah Sahasraakshah-sahasrapaad, says the Vedas. The thousands who come here, the children, the sick the aged, the diseased, the sad, the depressed - they are all Me; serve them and you serve Me", Baba declared. "The badge given to you now must not be cast away, after the three or seven days are over; it must be imprinted on your heart and be a permanent call and reminder of the mission, into which you are initiated now", Baba said. More than 50,000 persons arrived at the Nilayam, by the morning of the 6th; a long unbroken train of hundreds of omnibuses, and cars, scooters and motor cycles, brought thousands in; there were thousands who came by rail, and trekked the distance from Bukkapatnam or even boarded trucks to reach the place in time. When the Sivarathri Day dawned, the gathering shone in grateful joy, and cheered Baba, when He gave darshan, prior to the hoisting of the Prasanthi Flag on the Nilayam. Dr. Divakarla Venkatavadhanulu, Professor of Telugu, Osmania University , addressed the gathering on the significance of Sivarathri. Bhagavan discoursed on the basic faults that corrode into individual and social life. He said, greed or lobha is the root of all the banal competitions in the current world – greed for riches, for power, for authority over fellowmen. He said that this can be overcome by the cultivation of detachment, of tolerance, of the spirit of service and the deepening of faith in an ever present immanent God. He referred to the condemnation of the love for one's language, community, province or religion, and the exaggerated emphasis on the love for the nation. “The loyalty to the nation is built on the loyalty to the village, the family, the language spoken at home, the religion learned at the mother's lap, etc. You cannot separate the limbs and name the trunk as the source of all strength!" Baba said. Baba also emphasised the inherent excel­lences of the customs, conventions, rituals and ceremonies laid down by the sages, for limiting the vagaries of the human mind and regulating and educating his emotions and impulses. He said that the Prasanthi Flag has on it the symbol of the Sadhaka (spiritual aspirant), struggling to attain self-realisation. 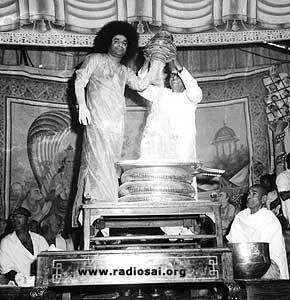 At 11 A.M. Baba proceeded to the Auditorium, for the Abhishekam. Bhajan from fifty thousand throats filled the air with a Divine fragrance; the path was a lovely carpet of flowers. The richly caparisoned Sai Gita (elephant) walked majestically in front. To the right and left, ancient of the ancient Vedas moved with Baba, chanting the mantras. 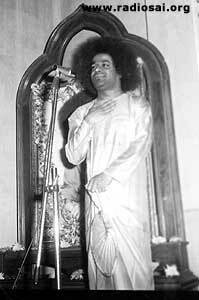 During the Bhajan, Baba gave the gathering the unique chance of witnessing thecreation of a nine-jewelled locket for Sai Baba's silver idol, and when He placed it on the forehead, between the eyebrows, it stuck! Then He poured from a wooden pot an unbroken stream of sacred ash on the idol, precious stones too falling from the pot, when His palm drew the sacred substance created by His touch. In the evening, devotees gathered before the Santhi Vedika, and the vast expanse of open space was tight packed with men and women, eagerly awaiting the discourses, the emergence of the Linga, and the night long vigil and Bhajans. Dr. V. K. Gokak, and Sri. Nakul Sen. I. C. S., Lt. Governor of Goa , spoke in English on Bhagavan and His Universal Message of Love. Dr. Pivakarla Venkatavadhanlu spoke in Telugu. Then, Baba delivered His Divine Discourse. In the Sanskrit Verse which was the prologue to His speech, Baba disclosed His identity; Naham manushyo (I am neither a human being) na cha deva yakshah (nor a god or superman), na Brahmana kshatriya vaisya sudra (nor am I a member of any one of the four castes) na bramhachari, na grhee, vanashthah (nor can you label Me as belonging to any of the four stages or Ashramas laid down by Sanathana Dharma), aham sathyabodhaka (I am the Teacher of Truth,) Sathyam Sivam Sundaram! My Reality is Truth Goodness Beauty! He said, "Sai Bhaktas (devotees) have to be pioneers in a new revolution, a transformation of character and endeavour; so, they have to fill themselves with Love so that the shower of unselfish universal Love can scotch the flames of anger, hatred, fear and anxiety that are consuming the world today. Sometimes, despair clouds the vision and people get panicky about the future of this country. But, I assure you that the country will not come to harm, either through internal or, external danger for, it is Bharath, (Bha meaning Bhagavan, God and Rathi meaning Attachment), the Land where the people are attached to God, and whom God loves." After the Discourse which lasted for one hour, Bhagavan sang a few Namavalis (bhajans) and enthralled the huge gathering into ecstasy. 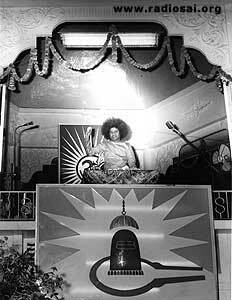 Meanwhile, the first indications of the emergence of the Lingam (symbol of the Formless‑All­ Formful God, Siva) from His Abdomen became apparent, and Baba sat in the silver chair. The gathering sang in chorus, in anxious expectation of the Miracle, the uplifting song, "Om Sivaya, Om Sivaya." About fifteen minutes later, a heavy oval Linga, glowing with divine effulgence, composed of a substance very much akin to opal came up and manifested its splendour to the vast multitude, uplifting them in a wave of adoration and bliss. On the morning of the 7th, when the Bhajan sessions which began at 8 P. M. ended, Bhagavan gave Darshan at the Santhi Vedika and blessed the mass of devotees with a short discourse. He said that the ‘Kirtan' (singing the Lord’s Name) should not end but, must persist as long as there is breath in the body. Sam-apthi is the word for Finish; but, it does not mean here, the end of progress. It means the apthi attainment of Sama or Brahmam (God). So, until the Universal Absolute is attained, this adoration of the Lord has to be continued. The Sastras (ancient scriptures) of this country will help you to understand Divinity. India is unique in this field - it is one composite culture, composed of a variety of languages, spiritual disciplines, valuable teachings, goals and paths, to suit the various types of people and various stages of development. Each is wholesome and useful, in its place, at the proper time." After the Discourse, Baba blessed the devotees and had Divine Prasadam distributed to every one of the 50,000 persons, so that they may break the ritual fast they had vowed the previous day. On the evening of the 7th, the Meeting held in the Auditorium was addressed by Brahmasri Kuppa Bairagi Sastry and by Swamy Karunyanandaji of the Jeeva Karunyasangha, Rajahmundry. Bhagavan spoke about the Guru and his responsibilities. Instead of elevating the Guru, who is all only a sign‑post to God, as God, it is much better to accept the God resident in you, as the Guru and pray to Him to guide you and take you nearer to Him. You cannot cross a river sitting in a boat of stone! You must surrender completely to His Will and dedicate thought, word and deed to Him. “I was asked by some scholars this morning about the adventure of putting man on the moon; I answered that, even on the moon, man has no peace of mind, he is anxious that the vehicle that will take him back to earth might not miss him. And, on earth below, he has not yet ensured peace! Journeying into the mind and controlling it by knowing its vagaries is far more profitable than journeying to the outer moon, the moon that has no illumining power of its own. The mind is the inner moon; one must discover it and master it. Love brings hearts together; Love for the sake of Love, that is to say, the greatest expression of Love, namely God. My teaching, My message, My practice, My mission is ‘Love’,” Swami said. “Love for God builds up the path of Bhakthi (devotion); it is so powerful that it compels God to assume the Form which it desires to visualise! Cleanse your heart, and invite Him to install Himself in it, in any Form you crave for; God is so compassionate that He moulds Himself in that Form and with that Name! But, chittha suddhi or cleansing of the heart is essential. All religions have this fundamental requisite in view. If the postage stamp is affixed, even a worthless notepaper on which is scribbled some trash, put into a dirty envelope will reach the addressee! But, not even the gaudiest envelope containing most sacred texts written in golden letters on the costliest of notepapers can reach the addressee, if it is unstamped! So, too, without a pure heart, the most pompous of pundits cannot visualise Him; with it, even the most illiterate, can!" “The Gita teaches the highest truth by stages. First, it prescribes Karma; then, it advises you to give up the desire for the fruits of Karma, while engaged in Karma; later, Dharmamarga (path of righteousness and duty) is prescribed, and after reaching a certain stage, you are exhorted to give up even Dharma and strive for Moksha (liberation); lastly, even that is explained away as a ‘desire' and the Sanyasa of Moksha (renunciation of liberation) is recommended as the Goal." On the 8th, Baba blessed the thousands of eager visitors from all the States of India, and from all the continents, giving to each one of them the coveted Vibhuti and the chance of Namaskara (touching His feet). 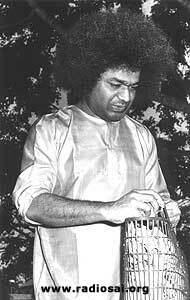 On the 9th, 10th and 11th March (1970), Bhagavan selected from among the thousands the old, the sick, the maimed and the afflicted, for being blessed with special interview, with Him and He gave them the consolation, courage, and cure they longed for. On the 12th, He left for Anantapur, where the building for the Women’s College is fast coming up. He will be at Whitefield for a few days, before proceeding on tour.